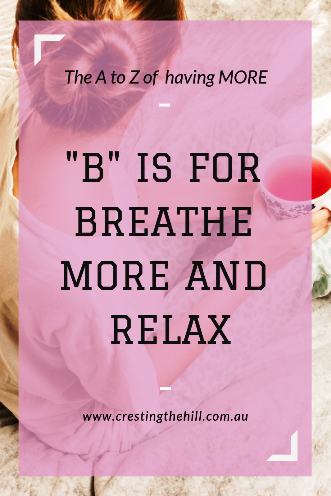 We're onto "B" for the second letter in the "List of More" and it's time to figure out ways to de-stress and exhale. Releasing your tight fist grip on life and the need to be in control of everything is the beginning of learning to breathe more and relax. First things first - take a deep breath - use all your lungs - fill them full of air, hold that breath for a couple of seconds and then slowly exhale. Breathe out all the stress and anxiety and annoyance - just let it go. (Did you know that deep breathing helps prevent pneumonia?) I've also noticed how often we sigh over things, and also how we hold our breath when we're stressed. It's time to be aware of what we're doing to ourselves and to proactively start breathing through it, rather than allowing the aggravations of life to control what's going on in our heads and bodies. 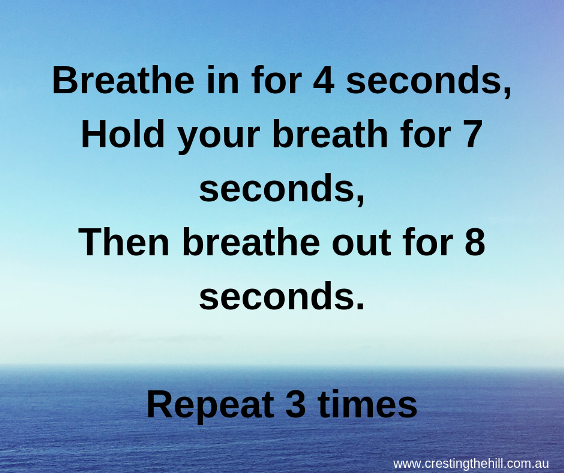 There is a wonderful breathing exercise where you breathe in for 4 seconds, hold your breath for 7 seconds, and then breathe out for 8 seconds. Repeat 3 times and you noticably feel yourself calming down. It helps me to fall asleep at night, and it also works when I'm feeling uptight during the day. Just being aware of my breathing makes a huge difference. Less stress and more calm - what's not to love about that? How often do we burn through our days with a million things on our "To Do" list and forget to take time to slow down a little and relax? Life gets frantic at times, and even if it's not full speed ahead, there is still so much going on. We get caught up in the busyness and run from one errand to the next without taking a few precious minutes to sit and smell the roses. Better still, take those few minutes to get outside into the fresh air and walk a little - smell the roses as you go, and leave some of that stress behind. Take a walk in the morning before things get underway, or slip out at lunchtime for a stroll. If all else fails and the day has gotten away from you, why not take your partner, or the dog, or a friend, and go for a sunset walk? Early evening is a beautiful time to be outside - and you just might get to know some of your neighbours in the process! Are you taking the time to breathe? Have you tried the breathing technique I mentioned to help you fall asleep at night? Are you a fan of taking an evening stroll and enjoying the sunset while you let the cares of the day fall away? If not, why not give it a try? Thank you for sharing this, Leanne. As simple as it is, I often need to remind myself to breath, especially in times of stress...and during yoga. :) Great quotes! I notice that I need to be more aware of how I'm breathing these days Donna - I do way too much sighing! Leanne, thanks, I needed this! Reminded me of a neighbor I had years ago--a guy who really took care of himself and was probably the healthiest person on the planet. In addition to running many miles a day, which you'd think was plenty of breathing, he sat outside and did deep breathing exercises every day. Swore by them. My Tai Chi instructor (who would be in her 70's I think) has a real focus on remember to breathe as we go through the movements Jean - she says deep breathing is vital as we get older to keep our lungs healthy. Hi Leanne, I've been learning more about breathing through my yoga. I'm terrible at just holding my breath when I do things especially exercise. Yoga has taught me to focus on the breath and it does make you feel more relaxed. I did recently do a lung capacity test and was very happy with my results. I watched someone doing a yoga demo on youtube and the breathing was definitely a big part of it Sue - which is another reason why I really have to take a class some time in the near future! 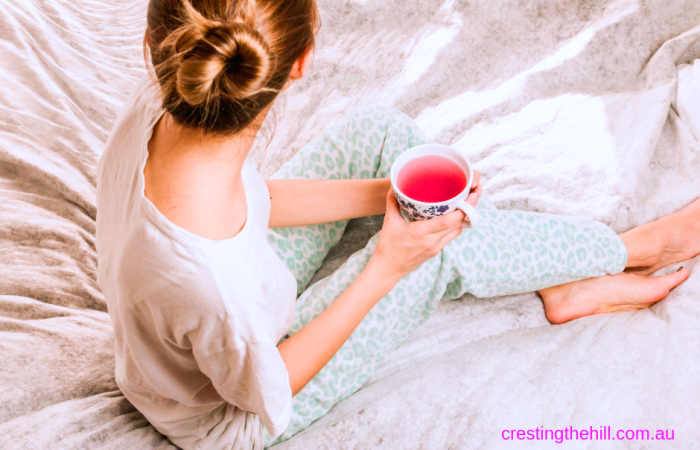 This is such a good reminder - I'm a big fan of this breathing technique when I'm lying in bed and can't sleep! I use it to get to sleep too Sam - some nights my brain is rabbiting around and it just seems to calm everything down enough to drift off. Breathing is such a normal process and most of us me included don't do it correctly. For me I find it hard to do when swimming and I'm sure I will never master it!! Oh well I'm having fun trying!! It's a nice way to chat and we tend to talk about more stuff than when we're sitting at home doing our own thing online or reading a book - plus a bit of fitness thrown in! I often knowing when I am NOT breathing well and that is when it is too shallow and quick. My husband first helped me with the breathing techniques to reduce anxiety. My Calm Meditation app helps me too. I have used breathing techniques through pre-cancer surgery stress, pain and more. We are nothing without our breath and yet we take it for granted. I'm trying to be more conscious of my breathing and the need to slow it down and breathe more deeply - especially when I'm annoyed or stressed! Calm breathing is definitely the way to go. I'm absolutely going to try that breathing technique at night to try and calm the monkey brain. The only time that I feel I'm aware of my breathing is when I'm out of breath. Those hills are definitely teaching you about breathing Jo! I'm thinking I need to walk faster or find a hill or two to make my lungs work a bit harder. And yes, the breathing technique definitely calms the mind - and it's free! 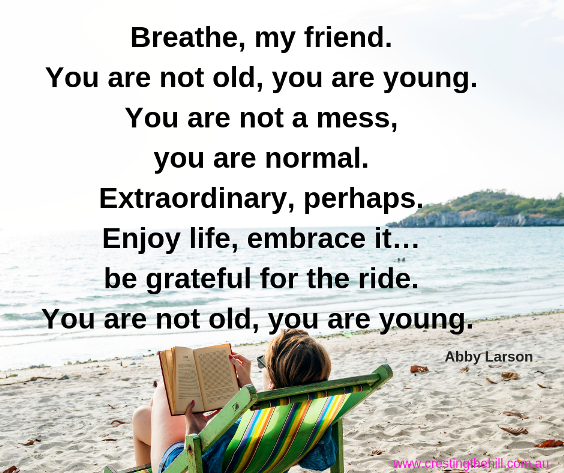 Hi Deb - glad it was a timely reminder - something I need for myself regularly too! Ah yes. Must remember to breathe. Yes indeed - and proper breathing too! I know that feeling where you're so stressed that your breathing is affected Min - I wonder why we do it to ourselves, then afterwards we're so glad we did. I'm glad the little meditation session helped and that you are out there representing Midlifers and all we have to offer. So true Leanne. I've probably mentioned this before, but I have a practice of stopping to take a few deep breaths each time I wash my hands during the day, and if I find I'm stressing over something, I take a deep breath and as I breath out I think "I let this go and allow the Universe to do her thing." It really seems to help. I also love your advice of getting outside on occasion. That always makes me feel better and stirs my creative juices. Thanks for another great post. I found this one on the Blogger's Pit Stop. 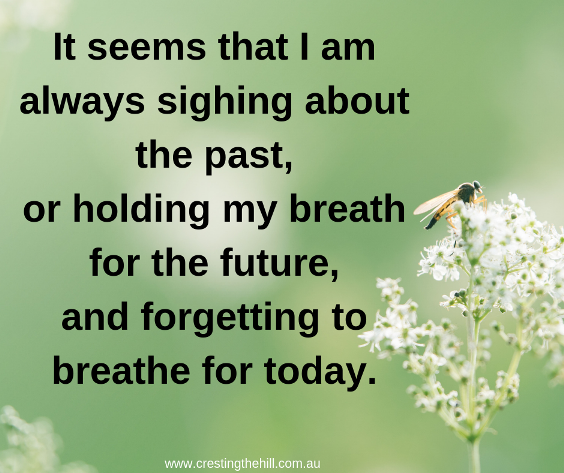 Hi Christie - I love the idea of having actual times where you remember to take that deep breath - I need to include that in my daily life too - I just might steal it - and make my own little mantra to go with it. YES! Even the way I sit and stand impacts on my ability to breathe as I should! Me too Michele! I have to keep reminding myself to sit straighter at work and on my laptop - I'm going to get Dowagers Hump by 60 at the rate I'm going! This is so important! Thanks for the great reminder. It's something I need to be more mindful of Janet - and it's something I need More of in my life - writing about it reminds me to put it into practice. Leanne you inspired me with your A to Z of More ... I did an A to Z of Colour (my OLW for 2019) but all in one post, never thought of breaking it up like this! 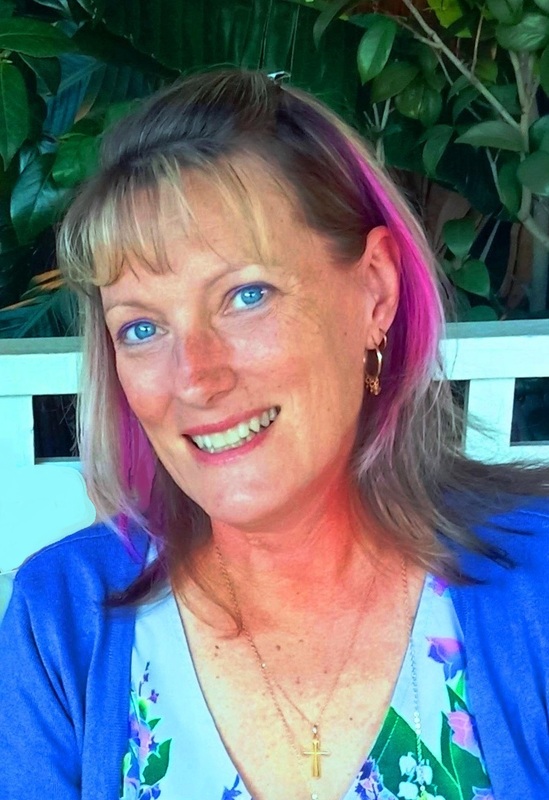 Hi Janet - I loved your AtoZ post and think it has the potential to be so much More! I hope you expand on it through the year and entertain us with how you're adding colour as you do it. Thanks Leanne, I need to remember to deep breath more often. I have tried the breathing technique to fall asleep. I try and do it five times and I am often asleep before I get to fifth time, it does not always work but great when it does. I am not sure where my last comment went?? Anyway I just wanted to add that the Blogger's Pit Stop will be featuring this post.